I'm so excited!!! I got asked to be on a design team for a brand new stamp company! 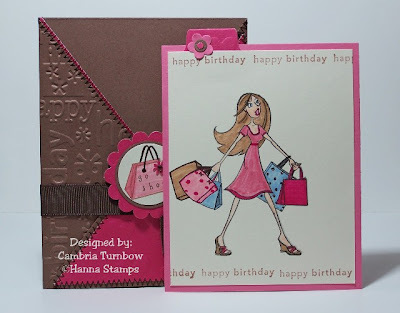 Hanna Stamps will be released October 5th!! Meanwhile, here is a sneak peek of the first stamp set. If you do some blog hoppin, you'll find more great samples..... it is an AMAZING design team! Kristi is working on the official Hanna Stamps web site, but you can check out her blog until it's up and running on the October 5th. She's a bomb! Isn't she THE coolest? Wow... the possibilities with this set are ENDLESS. I can't wait to find more time to stamp!! That hot pink paper is AWESBOMB! It comes embossed with those hearts. If you haven't seen the Love, Elsie collection of papers, you are missing out!! Paper: Close to Cocoa, Very Vanilla, Regal Rose, Betty Designer paper , Love, Elsie. 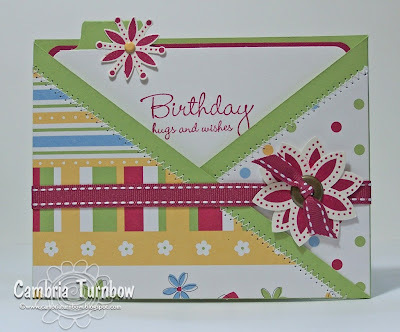 Other: Cuttlebug, Happy Birthday Embossing Folder, Circle Scallop Punch, Circle Punches, Round Tab Punch, Three For You Flower Punch, (punches all Stampin'Up!) Little Tiny Flower Punch on the bag is from Target Dollar Spot. 5/8 inch Chocolate Chip Grosgrain Ribbon, Sakura Glitter Pen, Janome Sew Mini, Scor-Pal. Hope you all had a great weekend!! Thanks for stopping by! Oh, I just couldn't resist this set, Bitty Boos Too.... especially since you can get it for 30% off until the end of September! Practically free baby!! I love Halloween stuff, but it needs to be quick and easy or it just doesn't get done. These little matchbook candy holders are fun. I've done them for Valentine's Day too. The kids always love them and they are very easy. Just toss the matches (or put them all in a zip lock bag and put them away for emergencies), cover with some designer paper (don't forget to add a bit of paper in the inside bottom so when you take the chocolate out, it matches). You can cover the candy bar too! 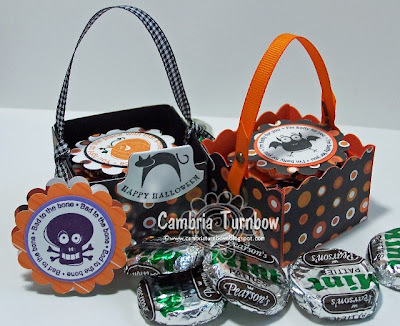 This set is perfect for those sweet little treats. 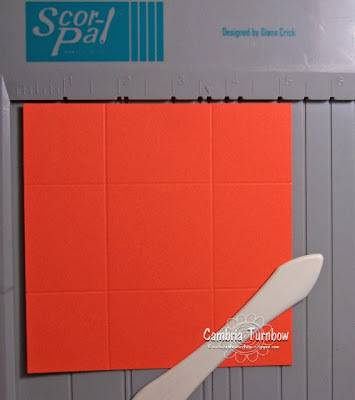 Use the 3/4 inch square punch to punch out your stamped image. 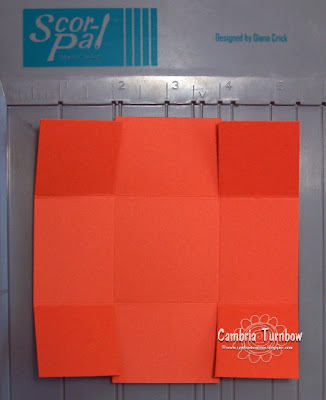 Then, cut a piece of Only Orange 1 x 1, then use the 1 1/4 inch square punch for the black. Add some ribbon and you are good to go. I took the inside box part out and rubbed the ends in the basic black ink pad, but you can add some paper there too if you want. The card is also really easy. Cut your card stock 4 1/4 by 8.5, score at 4 1/4. Trim 3/4 off the end. Cut your designer strip of paper 1 x 4 1/4 and add to the inside edge. Use the slit punch for the closure. I had to add a Jumbo eyelet.... because I'm addicted to them. Other: 3/4 Square Inch Punch, Jumbo Antique Brass Eyelets, Crop-a-dile, Black Gingham Ribbon, Scor-Pal. These little snack size popcorn pulls have been around forever, but they are fun and easy too. Especially with the Creepy Crawly DS Paper!! Just pull on the ribbon and up comes the popcorn pack! Always a big hit. You can do the same with regular size Hershey bars... or any size candy for that matter. Kids always freak out and think you are magic when they pull on that ribbon. Fun stuff!! Now, hurry and take advantage of those 30% sets before time runs out!! Have a super day! Thanks so much for all the nice comments... you are all too sweet! A couple more cards I made with the same Versamark resist sheet as the Criss Cross ones below. I really love the sentiment set All Holidays. The whole set has nice stamps that I know I will use, but I bought the set for this one... now I can't stop using it. Autumn Fest is 30% off until the end of the month when you purchase $30.00 in SU! products. You can see the Fall Frenzy promotion here. Hurry, before they are back to regular price. 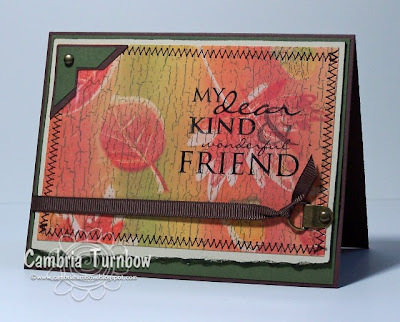 The background on this one was made by inking the background stamp Weathered with Always Artichoke classic ink (lay it on your table rubber side up), then ink the stamp with the Pumpkin Pie Spectrum pad and stamp right onto the backgrounds stamp. Then, stamp your leaf onto the Naturals Vanilla card stock. It's hard to see in the photo, but the leaves have the little crackles on them from the background stamp. Other: Rubber Brayer, Hodgepodge Hardware, Slot Punch, Natural Hemp, Janome Sew Mini, Scor-Pal, Dimensionals. 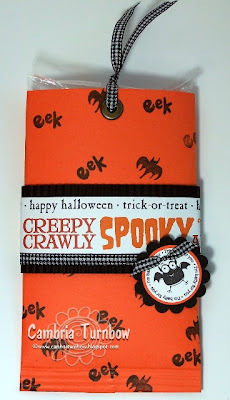 Check back tomorrow, I'll post my Halloween projects from my workshop this weekend. Hope you all had a great weekend! I couldn't resist the FALL FRENZY special this month. One of the sets I purchased is Autumn Fest. Of course I'm still stuck on the criss cross cards. I truly can't believe I waited this long to try one. I promise to post something else soon. In fact, I have some Halloween stuff to post after my workshop Sunday. I used one of my favorite techniques for this card. It's called Versamark Resist. Stamp the leaves all over a sheet of glossy card stock with Versamark. 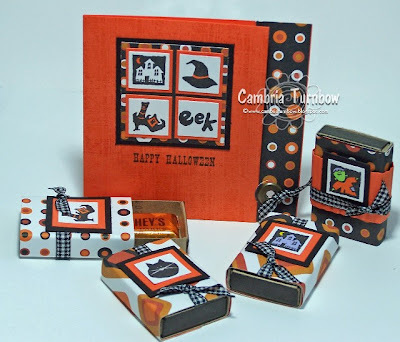 Take a rubber brayer and ink it up with a spectrum pad (pumpkin pie here) leave the ink pads out, do not push them together. Start on the short side of the paper and roll back and forth with even pressure until the color is completely blended. Ink the brayer again, and do the next section until the whole sheet is covered. After it's dry, take a tissue and wipe off the excess ink. Then, push the pads together on your Spectrum pad and stamp over the white images you made with the Versamark. Let dry, then wipe again with your tissue. I then cut the card stock into the size pieces that I needed. Then, I stamped over the entire piece with the Weathered Background stamp inked with Always Artichoke Classic Ink. Paper: Glossy, True Thyme, Naturals Ivory. Other: Jumbo Antique Brass Eyelets, True Thyme Stitched Ribbon, Large Oval Punch, Crop-a-dile, 5/8" Grosgrain Chocolate Chip Ribbon, Hodgepodge Hardware, Rubber Brayer, Janome Sew Mini, Scor-Pal. Other: Jumbo Antique Brass Eyelets, True Thyme Stitched Ribbon, Large Oval Punch, Crop-a-dile, 5/8" Grosgrain Chocolate Chip Ribbon, Hodgepodge Hardware. Janome Sew Mini, Scor-Pal. Oh, man... 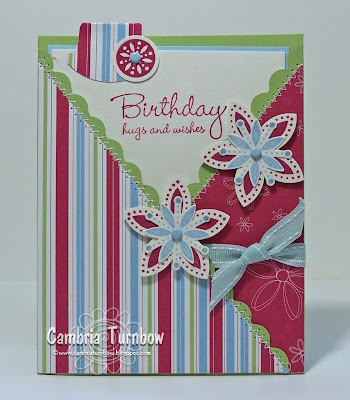 I just LOVE making these criss cross cards. I seriously can't stop. 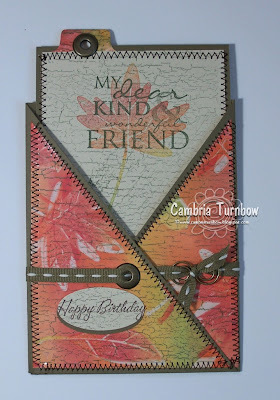 This one uses the designer paper Dashing from Stampin'Up! 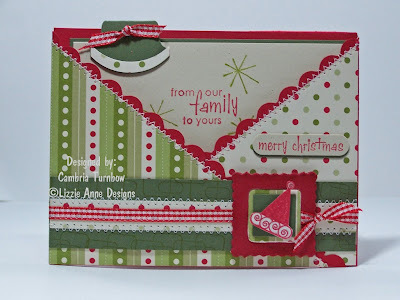 and the new stamp set from Lizzie Anne Designs called Christmas Cheer. Look at that font! I adore that Santa hat... can you tell? I promise to use the trees next time. I love the trees too. Check out the new releases from Lizzie Anne Designs! 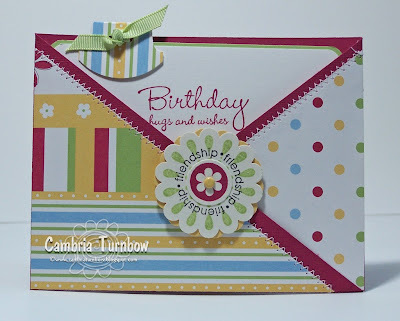 On the flaps, I used a new technique with the new corner rounder punch from Stampin'Up! My clever downline (and Aunt) Roseanne came up with this cool idea. You take the guide off the punch, punch it (as if to make the scallop), then line up the little metal V part with the edge of the cut you just made. If you want a tutorial, let me know and I'll try and take some photos later today. Thanks for sharing this with Roseanne... you da bomb girl!! 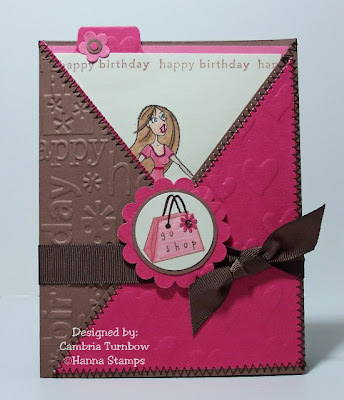 I think one of my favorite accessories in the new Stampin'Up! catalog are those large eyelets. I just want to put them on EVERYTHING. Maybe I just like to use my Crop-a-dile. LOL. Other: Round Tab Punch, Corner Rounder Punch, Circle Punches, Crop-a-dile, Large Eyelets, Cindy Ribbon (May Arts), Scor-Pal. Okay..... my grandma's precious bird flew away yesterday as she went out to check her mail (she didn't realize he was on her shoulder), so I am helping her make some flyers that the boys can take and give to neighbors. Poor Willy.... he was way up high in a tree and he kept saying "I'm a pretty, pretty, pretty bird." I hope we can find him. We tried until dark last night.... my grandma is heart broken. I had to try a criss cross card in the other direction. I LOVE these cards! 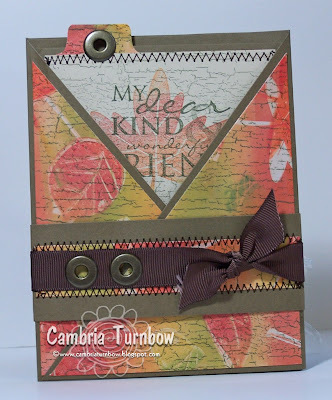 I made the scallop with the new corner rounder from Stampin'Up! Just remove the plastic guide from the punch and punch along the side lining up each end. 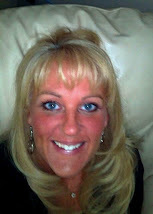 I want to wish my BFF Heather (HAM, HOOTS, MCHOOTY) a very happy birthday today!! I love ya HAM..... you are beautiful inside and out. You bring so much joy to my life. Thanks for always making me smile. Hope you have THE best birthday EVAH!! 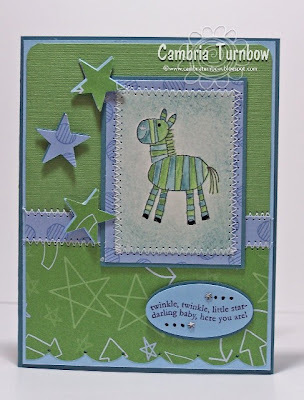 Paper: Certainly Celery, Bashful Blue, Shimmery White, Cutie Pie DS paper. Other: 5-petal Flower Punch, Snow Blossom Punch, Soft Sky Stitched Ribbon, Soft Subtle Brads, Dimensionals, Round Tab Punch, 3/4 inch Circle Punch, Corner Rounder Punch, Janome Sew Mini, Scor-Pal. Lizzie Anne Designs is releasing their new sets today!! Check them out!! I love this new Christmas set called Christmas Cheer. The font is SO cool and look at that Santa hat!! I can't wait to stamp more with this set! Other: Round Tab Punch, 3/4 Square Punch, Word Window Punch, Double Circle Punch, Sakura Glitter Pen, On Board Blossoms & Basics, Red Gingham, Scor-Pal, Janome Sew Mini. Have a great day everyone! Thanks so much for all the nice comments!! Oh Beate, how she inspires me. 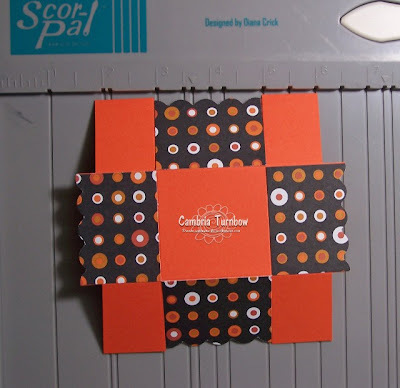 There is an awesome tutorial on SCS by Beate this week on these fun criss cross cards designed by the oh so fab Michelle Wooderson. Thanks Beate, sweet friend, for the constant inspiration. I've always loved these cards but never tried one until now. Okay... so did eveyone know that the 5-Petal Flower punch and the Snow Blossom punch fit the flowers in the In The Spotlight Hostess set? How cool is that? I think I fell off the face of the earth during summer! LOL. These are so much fun to make and easy too! I stitched with my machine on the sides, but other than that, I followed the tutorial instructions to the letter. Other: Large Eyelets, Crop-a-dile, Circle Scallop Punch, 3/4 inch Circle Punch, Snow Blossom Punch, 5-Petal Flower Punch, Round Tab Punch,Crafter's Tool Kit, Soft Subtles Brads, Stamp-a-ma-jig, Scor-Pal, Pomegranate Stitched Ribbon, Celery Grosgrain, Dimensionsals. So, the kids are all back in school and I don't know where last week went. Averie LOVES Kindergarten, but she had a very traumatic first day on the bus. Not only did they have her on the wrong bus (despite three calls to the bus company prior to school), but they didn't know where she was at. She arrived at my house over an hour past the time they gave me. It was traumatic for all of us. I'm so proud of her for getting back on despite her fear. Jayce and Baylor got new glasses and started flag football. I'm hoping this week will be smoother now that we are back on a fall school schedule. Hope you all had a great week. Thanks for stopping by!! I always struggle with masculine cards... hope the ribbon doesn't make it too girly. 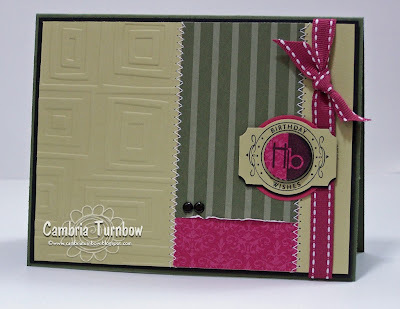 This layout was inspired by a card on page 131 of the Stampin'Up! Fall/Winter Idea Book and Catalog. I just love all the samples in the new catalog... I think they are better than any year. My first time using the new In Color, River Rock. I've seen some amazing cards with it and I was happy to crack open that pack. 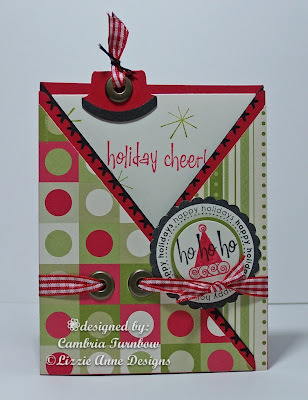 The Designer paper is from the Holiday Mini called Holiday Harmony Double Sided Paper. It's a two inch strip sewn on the River Rock. 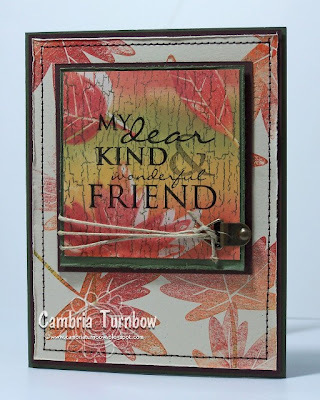 I ran the one end through the Cuttlebug with this embossing folder. The Party Punch stamp is stamped on River Rock card stock and punched out with the Designer Label Punch. Then, stamped again onto the Designer paper and the center punched out with the 3/4 inch Circle Punch. It's backed with another Designer Label punched out of Basic Black card stock then layered on top of a piece of Purely Pomegranate circle of card stock punched out with the 1 3/8 Circle punch. Paper: River Rock, Always Artichoke, Basic Black, Purely Pomegranate, Holiday Harmony DS paper. Other: Designer Label Punch, 3/4 inch Punch, 1 3/8 inch Circle Punch, Dimensionals, Pomegranate Stitched Ribbon, Cuttlebug, Traffic Jam Embossing Folder, Vintage Brads, Crafter's Tool Kit. My kids start school tomorrow!!! I'm going to miss them, but they are ready to go back and I'm ready for some free time. Sleeping in a bit is over... back to the Fall schedule. Averie is so excited she can hardly stand it. I will take her to school (she starts afternoon Kindergarten) and she'll ride the bus home. I'm nervous about that, but she insisted that she get to ride the bus home. Oh boy... everyone in school.. I can hardly believe it. Have a great week everyone! Thanks for stopping by!! I'm still using the Darling Doodles Designer Paper pack..... amazes me how far a package of paper goes. My friend had a sweet baby boy a couple weeks ago. I'm SO late with a card. I had a bit of time this weekend to try and catch up a bit. The Zebra is stamped on Shimmery White card stock and colored in with my aquapainter with Wild Wasabi and Blue Bayou ink ink. I added some black with my Sakura Glaze pen to his hoofs and some glitter with the Sakura Glitter pen to his tail and mane. I masked him and stippled around him with Soft Sky and around the edges with a tad of Blue Bayou. He is then stitched on to a piece of DS paper (opposite side of the paper on the bottom), then adhered to a piece of Blue Bayou. Paper: Blue Bayou, Soft Sky, Shimmery White, Darling Doodles Double Sided DS Paper, Wild Wasabi Textured. Other: Star punch, Large Oval Punch, Corner Rounder, Aquapainter, Stipple Brushes, Dimensionals, Sakura Black Glaze and Glitter pens, Crafter's Tool Kit, Star Jewels, Score-pal, Janome Sew Mini. Basic Grey Precision File set on some chipboard that I covered with paper to get in all the grooves and oh man it's AWESBOMB. I have no craft stores in my small town, so every time I order from Joy and Daisy, it's like Christmas when the box arrives. If you don't have those Sakura Gel and Glitter pens yet, go and get em baby..... I love them and use them ALL THE TIME. Don't forget to use the coupon at checkout!! :) Happy Anniversary Kurt and Joy!!! Okay, I'm really going to catch up on some things today and finish getting the kids ready to start school on Wednesday. My sweet son, Sheldon has been helping with laundry all weekend and now you can actually see the floor! I love that boy! Okay... so I made a deal to trade some Xbox time, but it's worth it. Hope you are all enjoying the holiday weekend. Stay safe!